Actually it's Boxing Day, so I'm a little late with the holiday greetings. Since it's Sunday and I got my housecleaning done (Friends are visiting tomorrow! 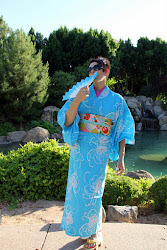 ), I felt like I had to do another kimono post. What kind of shoes do you wear with kimono anyway? Special shoes! 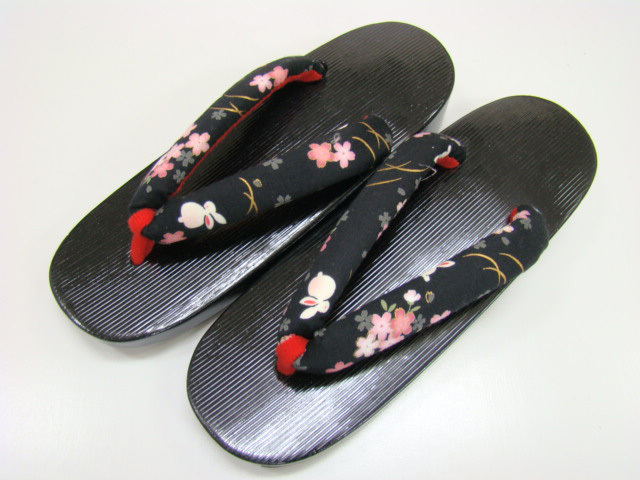 There are two main types of footwear you will see on women wearing yukata or kimono: Geta and Zori. So what is the difference? First, here are some pictures form my geta collection, these are from Antique Trading Ryu Japan. I bought all three pair last year since they were having an awesome sale: each pair cost me about $5 plus shipping. (Some friends and I went in together and bought several pairs, so the total for each pair with shipping was about $14). 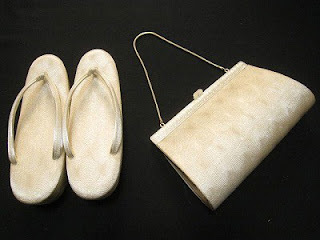 Geta are very informal and are for wearing with yukata for the most part. The base is wood and the fabric (hanao) part that goes between your toes is usually cotton or silk. You don't usually wear tabi sox or tabi with these, so think of them like western sandals you would wear in the summer with shorts or a sundress. If you are going to wear a summer kimono such as a sheer one (You wear a juban underneath of course!) 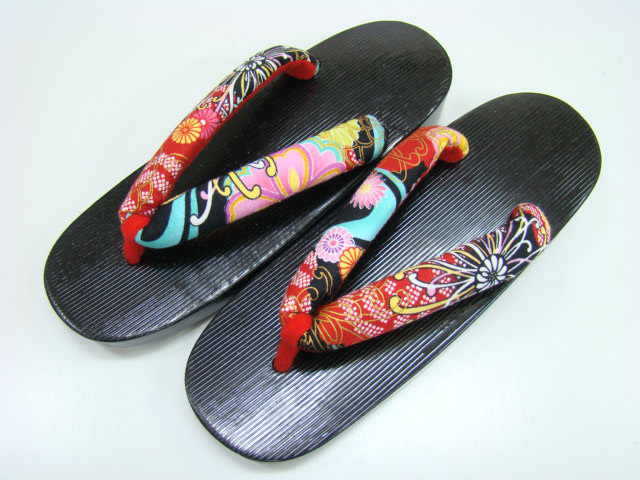 of sha or ro silk, geta can also be worn if it's a casual style kimono such as a komon. 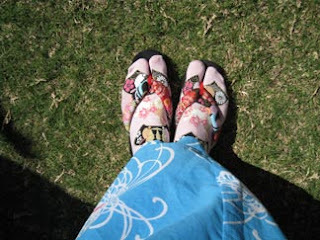 I have worn geta with fun patterned tabi sox on days when it's a bit chilly, such as when I wore the brightly colored geta with spider mums with my pink bunny tabi sox in October at a festival. The yukata has spider mums on it too! 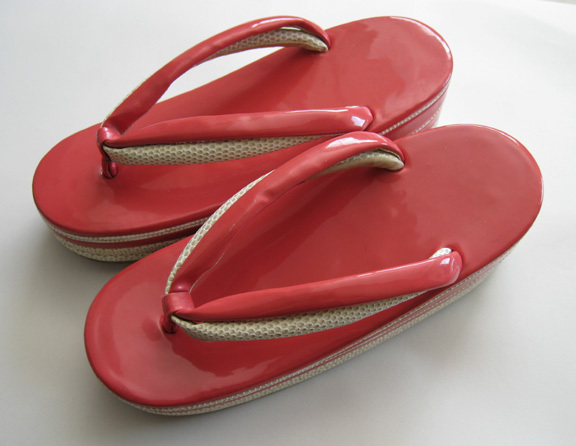 Zori are the dressier-type footwear of choice when wearing a kimono. They actually range from casual to very dressy. The main difference is that they are not made from wood and have a taller, wedge-shaped heel. 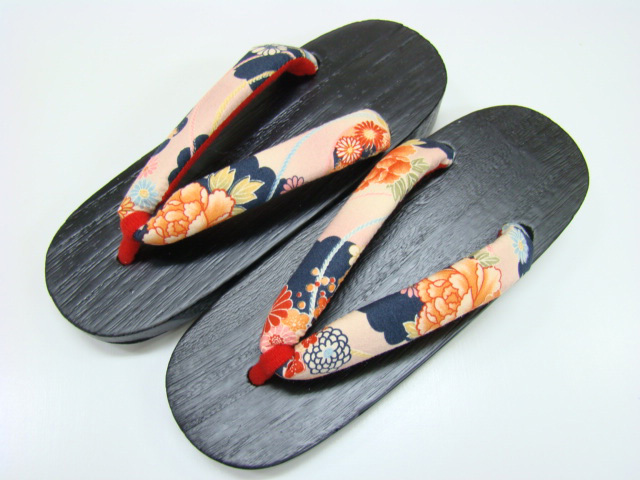 The foot bed is a bit narrower than geta and they are often a bit cushiony. The heel is always covered with fabric, leather, vinyl, etc. 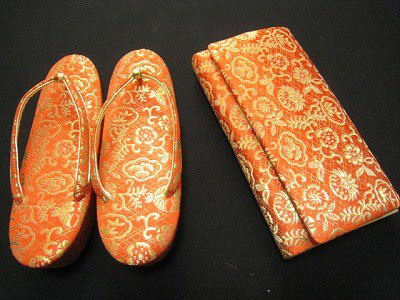 Gorgeous and expensive pairs of zori, often with a matching purse, are available to wear with furisode or other formal kimono and are made from embroidered silk or other equally beautiful silk fabric. 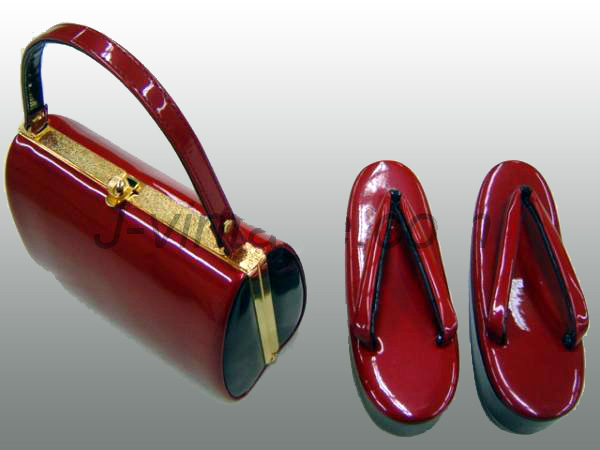 I have seen zori-purse sets embellished with Swarovski crystals for over $200.00. I own a few pair of zori and there is a nice range from casual to dressy. I even have a pair of silver zori with matching purse to wear with a kurotomosode or other formal kimono. That pair is on the bottom and they get progressively more casual as you go up. My favorite pair for wearing are the blue/pink gradation since they have decent padding and are comfortable. The pink pair is very small and short so I will either adjust the hanao or give them to one of my tiny-footed friends. One thing you find out after you have a bought a few pairs of these is that you need to look at the length in centimeters, not the western shoe size if it's given. Measure the length of your foot and look for a pair that is close to the length of your foot, in centimeters. It's OK if they are a bit short and your heel comes off the end; the "my shoes are too small" look is actually the look you are striving for. Just don't go beyond 1/2" of heel overhang. The geta I bought from Ryu (Above) were "one size fits most" and they are fine for me, my foot hangs off a little over 1/4" and I wear an American size 8-1/2 to 9 shoe. So when I shop for zori and geta online I usually look for 24-24.5cm but I can get away with 23.5 cm. There are larger sizes available and Ichiroya sometimes will have 25-25.5 cm zori for sale. You just have to keep looking around. I have worn the silver zori-purse set once with my kurotomosode. Haven't worn the vermilion pair yet, but I do have the perfect ensemble to wear them with already, the green "Pierre Cardin" iromuji and cream/orange karabana nagoya obi. The red-black pair goes with most outfits but I'd like to get a casual pair that do not have any black. Maybe red and white or just red with a small pattern on them. 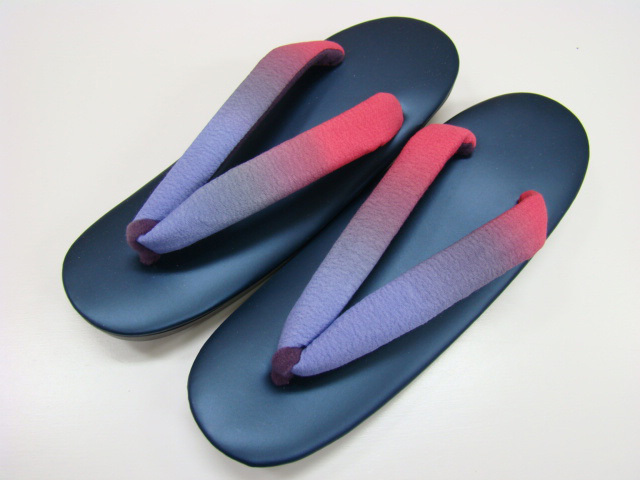 I'm still looking for blue zori as well, but blue is not a color you see very often! Have a great week....it's almost the New Year!